Although I’ve got many old mixtapes to choose from for this series, most of them are from the same era, late 90s Christian alternative rock. And most of the recorded from radio tapes I have are from the early 90s. So it’s a bit of a challenge to vary the tapes I choose to post here… I don’t want to get stuck in any one era or genre for back to back episodes. My first choice for this episode, was the very first mixtape I ever received…like 1982 or 83… kind of a miracle that it’s survived all the years. But when I was digitizing it, I realized that the back side had been recorded over in 1991, with the same kind of AT40 pop that was featured in my last episode… so I decided to wait to post that one. Instead, I decided to stick with something that features music from the 80s. As I’ve said before, I really wish that more of the tapes I recorded in the 80s had survived… but it appears most of them have been recorded over over the years. 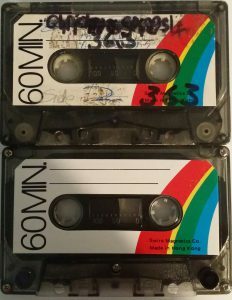 There are 3 specific tapes that I remember having, and making a point to preserve, for years. They were all 3 recorded somewhere in 1983 or 84. I remember a lot of things about these tapes and a lot of the songs that were on them. Hearing those songs now, after all these years, still brings back memories of those tapes. I wish that I could remember more from them… the exact order the songs were in… if I’m even remembering all the songs that were on them. Two of those tapes were recorded using my parent’s console stereo…which had a radio tuner, record changer/player, and 8-track player, but no cassette deck. 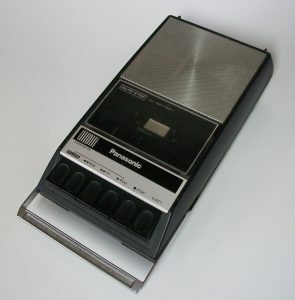 My dad had figured out how to connect a small Panasonic tape recorder to the “tape out” of the console stereo, so that you could record onto cassette without background noise. We used this method to record from records and 8-tracks as well as from the radio. In fact, once we got a compact cassette to 8-track adapter, we could record from cassette tapes onto cassette tape too. It wasn’t exactly stereo “dubbing” like the boomboxes I would lust after years later…but it worked much better than the method I typically used to record. I remember one of them was recorded from Wichita’s KKRD, which I briefly mentioned in the last episode. I can’t specifically remember what station the other one was recorded from. But I definitely remember being glad that my dad let me use the big stereo, listening with the big earphones, because dad didn’t exactly appreciate my music choices at the time… although if I remember correctly, the reason why I got to record from the “rock” station one of those times, was because he had actually listened to it one night for some strange reason…otherwise it was almost always country for dad (I’ll have to see if I can steal and digitize one of the “best of 83” tapes he recorded from the year end country countdown, for this series…I haven’t listened to those since the 80’s…remind me to do that sometime when I’m over at my parents’ house). I suspect that those 2 tapes were recorded in early 1984… but a lot of the songs were from/hits in 83… although one of them had Footloose one it, which was released in 84… but I know for sure that I recorded those tapes in the house that we moved out of during the summer of 84. I can pinpoint the exact date I recorded the third tape I’m recalling here… because it was recorded from a broadcast of American Top 40. Initially, I was able to remember that Casey mentioned the year end countdown would be coming up in the near future… so I knew it had to be from December… and I knew that meant that it had to be recorded in 1983, because we had moved out of that house by the end of 1984. Several years ago, I decided to try and research to figure out just which week that countdown was from. Eventually, I realized that it must have been the weekend of December 24th… and I deduced that I must have actually recorded it on Christmas Day, because I remember receiving the tape I recorded it on, (a translucent tape with a rainbow on the label) as a Christmas gift from one of my cousins on Christmas Eve, the night before. An interesting thing about this tape, is how I let the tape record everything, Casey’s dialog as well as the commercials that aired…whereas the other tapes I’m talking about had all of the DJ banter cut out…meaning that the beginning and endings of the songs were abruptly cut off in order to cut out the talk… (it didn’t help that dad’s tape recorder didn’t have a “pause” button on it… so the stops were much more abrupt than on a tape recorded with “pause”). Also, unlike the other 2 tapes, this one was recorded by my typical method of setting the tape recorder next to the radio’s speaker. Now this would have been the clock radio my mother had bought for me at a garage sale, sometime in the prior 2 years or so…that clock radio really set the course for my entire life, in that it was my first music playing device and my introduction to pop/rock music. The tape recorder was possibly a Fisher Price tape recorder, which I was given for Christmas, probably the year before…or maybe I had already outgrown/ruined the FP and had been given a new recorder earlier that day…I can’t remember for sure… although I vaguely remember hearing the kind of grinding that I kinda remember the FP making on that tape… and maybe I got my next player for my birthday, not Christmas. All I know, is that I went through more tape player/recorders than I could ever begin to remember, when I was a kid… they didn’t last very long for me…usually not much more than a year. The one thing that always stood out to me about this tape, was the “story” Casey told to introduce the Jump In The Saddle song “The Curly Shuffle”… I have always remembered the way he described the inspiration for the song, Curly from the Three Stooges. I also remember a time when I listened to that tape on the first night I spent in my own room, after moving out of the room I had shared with my brother… and during that particular listening, highlighting a song by a band called Naked Eyes… who I would later recognize as the act that covered “There’s Always Something There to Remind Me”… but the song from that particular AT40 broadcast turned out to be a lesser hit called “When the Lights Go Out”… which peaked that week at number 37 on Billboard’s Hot 100. And there were a number of other songs I remember, that were by artists who had bigger hits… but those lesser hits still stood out as great songs, if not better than the bigger hits the artists were known for. I have no idea what happened to these tapes. The last I remember of that recording of AT40, the tape was in pieces in a ziplock baggy, waiting to be put back together. I know I held onto it for years because it meant so much to me, but now that I can’t find it anywhere, I figure I must have thrown it away at some point, giving up on the idea of ever fixing it. As for the other two… I have no recollection of whatever happened to them. I suppose I recorded over them at some point, when I had a better means to record in better fidelity. I’ve gone through my old tapes, hoping to find one of them… but by this point I’ve mutilated the labels on the cassettes so badly, there’s probably no hope of ever recognizing which tapes they were. After reflecting on these old, lost tapes for a while, I really got to thinking about a lot of the songs that were on them. 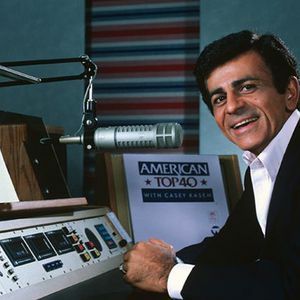 I did the research to find out all the songs that were on that particular American Top 40 countdown, and I was blown away by just how great so many of those songs were. I ended up realizing that 1983 was an amazing year for pop rock, Top 40 music. It seems like the 80s got a slow start, with soft rock and the remnants of disco dominating the charts. But as those sounds gave way to new wave and some edgier R&B, some great, almost “alternative” sounding music started appearing. I also realized that 1983 was the first year that I really found and dug into the radio… as so many of these songs are the foundation of my earliest remembrances of favorite songs. So I decided to make a new mixtape… based on the stuff I remember from those tapes…rooted in the musical year of 1983. Now, I wanted to avoid just simply rehashing the same big hits that we hear all the time. I wanted to make it a point to dig deeper, and pull up songs that I vaguely remember from these tapes, that we don’t hear played much on 80s/oldies radio (Oh how I hate that the 80s are played on “oldies” radio now… “oldies” was what we listened to in the 80s, that wasn’t the current music… you can’t just add the 80s music to the “oldies” format now… my 80’s child brain needs the distinction between the 2 and can’t handle that line being blurred now). Some of these songs were bigger hits than others…and some of them still do get played/recognized today…but I made it a point to stay away from the artists’ biggest, most well-known hits. I don’t want to take too much time/space listing out and detailing every song. But I want to hit a few highlights. The first song is one that I remember being at the beginning of that KKRD tape. 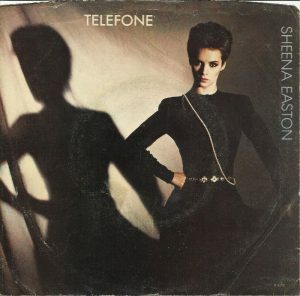 Sheena Easton is more known for her 1980 hit “Morning Train” or the 007 theme, “For Your Eyes Only”, but “Telefone (Long Distance Love Affair)” definitely stood out to me more, because of that old tape. Of course, it wasn’t until the early 2000s that I figured out she sang the song. That was the time when I started compiling a collection of 80s mp3s… and I was trying to remember all these obscure songs to add to the collection. I had to consult a friend at work about a lot of these songs, since he was old enough in the 80s to know and recall a lot of these songs I barely remembered. 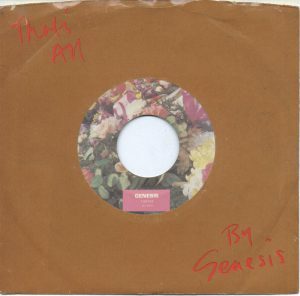 And then it turned out he actually had the song on a 7” 45 single that he let me borrow to digitize for my collection (I need to get that, and the rest of the records I borrowed from him, back… good thing we’ve reconnected through Facebook). It’s interesting to me that you almost never hear that song today, despite the fact that it was a top 10 hit, peaking at #9 on Billboard’s Hot 100. Another song that coworker reminded me of was Frida’s I Know There’s Something Going On. That was one I had completely forgotten…but he thought I might recognize a song or two of hers… so he lent me a CD. I instantly recognized that drum beat and guitar solo. You know… I think that 1983 had some of the best guitar solos ever… and they were often in totally unexpected songs/genres. Of course, Eddie Van Halen made a name for himself by providing Michael Jackson’s “Beat It” (not on this mixtape) with a ripping guitar lead… and Toto’s Steve Lukather gave Lionel Richie a real beauty on “Running In The Night” (also not on this mixtape). But songs like “I Know There’s Something Going On” and Jeffrey Osborne’s “Stay With Me Tonight” also provided raw, powerful, edgy guitar solos that one would never expect from their genres/formats. Frida’s song barely missed the top 10 at #13, “while Stay With Me Tonight” just cracked the top 40, peaking at #30. Other songs I remember from that KKRD tape include Duran Duran’s Union of the Snake, The Romantics’ Talking In Your Sleep, and Genesis’ That’s All. For years, Union of the Snake was the song that defined Duran Duran for me. When I started searching to find that song in the 90’s, I wasn’t even 100% positive it was Duran Duran…but I just had a hunch that’s what they sounded like…or maybe I had remembered seeing it listed with their name in a TV commercial for a compilation record. Either way, I was actually disappointed when I started digging through their more known hits, and none of them seemed as edgy/rocking as this one was. But once again, my coworker friend came through and lent me his Duran Duran CD… and sure enough, the song was called “Union of the Snake” and I still LOVED it after all those years. Again, it’s shocking how little you hear of that song these days, considering it was a #3 hit. “Talking In Your Sleep” is a song that stuck with me through the years… a great example of the kind of rock beat that certainly informed my tastes throughout my entire life. A much more new wave sound than the band’s earlier hit “What I Like About You”… and another #3 hit that seems overshadowed by the other song. That’s All was a song that I recognized years later, and quickly realized it was Phil Collins’ voice. Little did I know that Genesis would one day be such a big part of my vinyl record collection. A few, even more obscure songs I included were from that AT40 countdown. Since that recording was from the lower end of that week’s countdown, it included several songs that didn’t chart quite so high…so I am glad that I got the opportunity to hear those songs for a few years after they had briefly brushed the top 40. 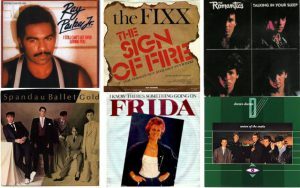 These songs include The Fixx’s #32 hit, “The Sign of Fire”; Spandau “Ballet’s Gold” at #29; and, Ray Parker Jr. with his “I Still Can’t Get Over Loving You”, which peaked at #12. There are several other songs on this mixtape… some of which might not have been on one of those tapes originally… but who’s keeping track? One song I included does sorta break the 1983 rule… sorta. Although Huey Lewis and the News’ “Walking on a Thin Line” was released on their 83 album Sports, it wasn’t released as a single and on the charts until 1984. But it was another song that always stood out to me as my favorite from an artist, even though it was less of a hit, peaking at #18.